Wouldn't it be a wonderful opportunity for the family or kid show entertainer, to be able to perform the Multiplying Bottle Routine with something more appropriate for children such as... Potato Chip Cans? Thanks to AmazeKids and our partners at Twister Magic, now you can. Watch the video at the top of the page and you'll see the magical possibilities and the impossibilities for yourself. 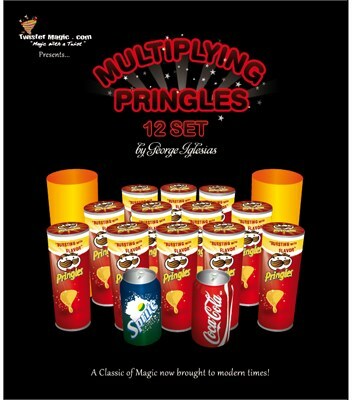 First a Pringles Can and a Soda Can magically change places a few times and then the fun really begins. As you lift the two yellow tubes Pringles Cans keep appearing. You can find them when you lift the tubes or extract them from the top of the tubes. They're everywhere! At AmazeKids we recommend that you play this for laughs, pretending to be overwhelmed as the magical multiplying gets out of control. As the quantity escalates, so will the audience's laughter. The potential for variations as you inject your own preferences into this routine is huge! So many possibilities. When you check out, you can choose either the basic routine with eight cans or the deluxe routine with 12 cans. If you order the 12 can version, you get all the extra cans and necessary sticker gimmicks. You supply any 2 Real Pringles Cans and 2 soda or juice cans of your preference. In the Instructional DVD George Iglesias will guide you step by step in the performance of the routines and preparation for your shows. If you do kids magic or comedy magic at private parties or on the stage, the Multiplying Potato Chips have the potential to become part of your permanent repertoire. And they'll last that long, too because they're made out of a plastic durable material will last a lifetime! So go ahead. Put in all the chips and make the bet that you'll get more laughs and more amazement when you make the Multiplying Potato Chips part of your family show. Be prepared to do some sanding that is not explained in the instructions. I had to do some work on the real Pringles cans. It may have been a problem with just my set, but the production of the final real Pringles can would "stick." I had to do quite a bit of sanding to get it to work. The folks at AmazeKids were very helpful and they have contacted the manufacturer. Hopefully they will fix the problem. If not, be prepared to do some sanding on the real cans. A Dremel tool helps. Once fixed, the trick itself is pretty good. I love the fact that you can use potato chip cans rather than the traditional martini bottles. I always loved the trick but producing bottles of alcohol never fit my style. The chip cans are an outstanding idea.